Multigrain Banana Streusel Muffins | Rosetta Bakes! I realize not every one wants to eat baked goods loaded with butter and sugar, so every once in a while I’ll try a new low-fat version recipe instead of the regular version. I’m not usually a fan of low-fat version recipes, but I was told by my co-workers that this was a really good low-fat muffin and a keeper for sure. Maybe it’s the flaxseed I’m not familiar with, or the low-fat versions of peanut butter and sour cream, I’m all for the regular versions; but, for those who want the healthy versions, according to my co-workers, this is a muffin you should try! 1. Preheat oven to 375F. Line about twenty 2-1/2 inch muffin cups with paper baking cups. Lightly coat baking cups (even paper ones) lightly with cooking spray. In a large bowl combine oil and peanut butter. Beat with an electric mixer on medium speed 30 seconds. Add brown sugar, beating until combined. Add egg, cereal, bananas, sour cream and vanilla; beat just until combined. Set aside. In a bowl combine all-purpose flour, while wheat flour, flaxseed meal, baking powder, nutmeg and salt. Alternately add flour mixture and buttermilk to banana mixture, beating on low-speed after each addition just until combined. 2. Spoon batter into prepared muffin cups, filling eath about three-fourths full. 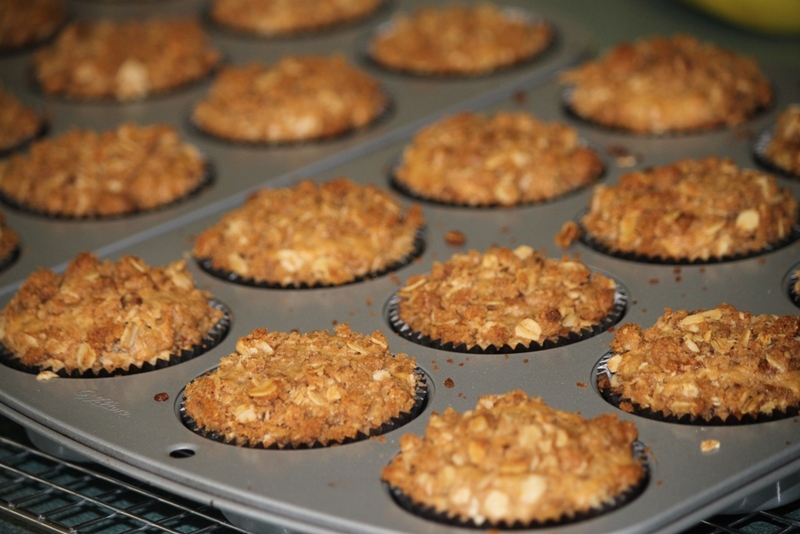 Sprinkle Streusel Crunch Topping evenly over batter in muffin cups. 3. Bake about 20 minutes or until light and brown and tops spring back when lightly touched. Cool in muffin cups on a wire rack for 5 minutes. Remove from muffin cups. Makes about 20 muffins. Streusel Crunch Topping: In a bowl combine 1/4 cup all-purpose flour, 1/4 cup rolled oats, 1/4 cup packed brown sugar and 1/4 teaspoon ground cinnamon. Add 3 Tablespoons canola oil; stir to combine. * TEST KITCHEN TIP: To make 1 cup sour milk, place 1 Tablespoon vinegar in a glass measuring cup. Add enough milk to make 1 cup, stir. Let stand 5 minutes. ** PER MUFFIN: 172 calories, 7 grams fat (1 g sat fat), 12 mg cholesterol, 143 mg sodium, 24g carb, 3 g fiber, 4g pro. *Recipe from a Better Homes and Gardens magazine called “Fall Baking.” This magazine is loaded with fantastic fall recipes!